Pokhara valley is situated at an altitude of 827 meters above the sea level and is 200 kilometers west of Kathmandu valley. Prithivi Raj Marga is the highway linked with by Bhairahawa by Siddhartha Raj Marga [Sunauli border]. It is a combination of the long arrays of world famous snow clad peaks, emerald lakes, turbulent rivers with deep Georges and picturesque villages inhabited by major, Gurungs and Thakalis. Pokhara offers the magnificent views of Dhaulagiri, Manaslu, Machhapuchhare, five peaks of Annapurna Himalayas and others. Pokhara numerous lakes known as "Tal" in Nepal offer fishing, boating and swimming, which ensure the famous Phewa, Begnas and Rupa lakes of Pokhara. 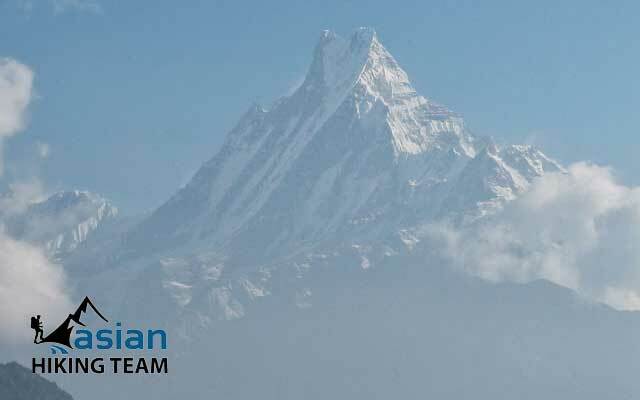 Pokhara is also referred as the center of adventure. It is the starting point for most of the popular trekking & rafting destination. The serenity of Phewa Lake and the magnificence of Machhapuchhare [6,977m] rising behind it, creates an ambiance of peace and magic. Phewa Lake is situated at an altitude of 784m above sea level with an island temple in the middle of the lake. It is second largest lake in the kingdom. A temple situated on the island is the two storied pagoda dedicated to the boar magnification of Ajima. The reflection of Mt. Machhapuchhare & Annapurna can be seen in its serene water. Thick forest lies on the adjoining southern slopes of the lake. 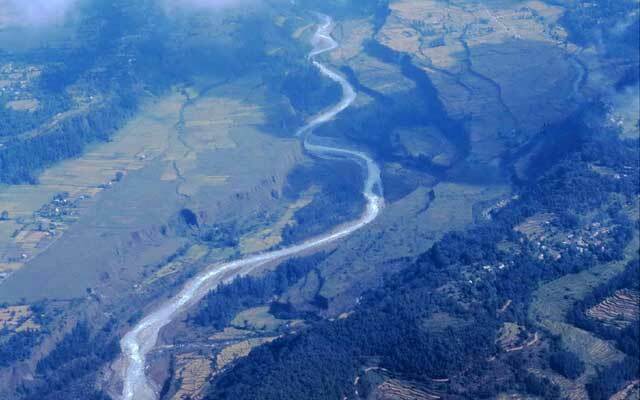 Seti River Gorges carved by Seti-Gandaki is one of the natural wonders of Pokhara. K.I. Singh bridge at Bagar, Mahendrapool & Prithivi Highway Bridge near bus park, provides a perfect view of the river's dreadful rush and the deep gorge made by the turbulent flow of white water. Davi's Water Fall locally known Patale Chhango in the southern flank of the Pokhara valley is where the stream flowing from Fewa Lake collapses and surges down the rock into a deep gorge, leaping through several potholes. Mahendra cave lies at the north of the Pokhara valley. It is a large limestone cave which is one of the few stalagmite stalactite caves found in Nepal. Tibetan Village Tashiling in the south and Taxi Palkhel in the north of Pokhara valley is the two Tibetan village which is inhabited by the Tibetan people who keeps themselves busy by producing and trading woolen carpets and other handicrafts. Museum: One museum displays the lifestyles and history of the Gurungs, Thakalis and Tharu and another one Natural history museum and is functioned by the Annapurna Conservation area project. Butterflies, insects, birds and wildlife found in the Annapurna region. Mountains Views: Spectacular Panorama of the Annapurna range forms the backdrop of Pokhara valley. The mountains stretching from east to west include Annapurna I to IV. It lies at the distance of 40kms from the valley and at the elevation of 900m. Among these Annapurna, Annapurna I (8.091m high is the highest peak. Mt. Machhapuchhare with its pyramid shape dominated all the other neighboring Peaks. The other peaks are Mt. Dhaulagiri 8167m, Lamjung Himal 6983m and Manaslu 8163m and Himalchuli. Barahi Temple: This is the most important religious monument in Pokhara. Built almost in the middle of Phewa Lake, this two-storied pagoda is dedicated to the boar manifestation of Ajima, the protector deity representing the female force Shakti. Devotees can be seen, especially on Saturday, carrying male animals and fowl across the lake to be sacrificed to the deity. Bindhyabasini Temple is the center of religious activity in the old bazaar. It is dedicated to Goddess Bhagawati, yet another manifestation of Shakti. The park like grounds offer a fine picnic area, and on Saturday and Tuesday when devotees flock there to offer sacrifices, take on a festival local flavor. Sarangkot Australian Camp hiking start hiking from Sarankot all the way to Naudanda. Passing through the candle than climb 45 minutes to reach Australian Camp. The magnificent view from Australian Camp than hike to Dhampus village. End your hike in Dhampus Phedi than drive half an hour to Pokhara. 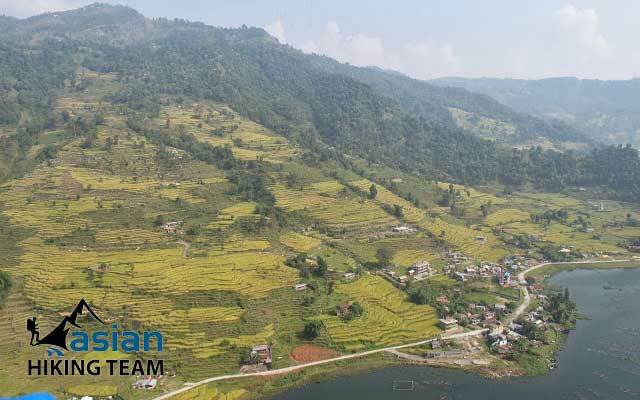 5 Day trip brings from Kathmandu to tourist paradise city Pokhara, sightseeing in Pokhara one full day and 2 days hiking than return to Kathmandu. Highlight of trip: Short and easy hiking, nearby Pokhara, Sunrise and sunset view, hidden valley view, Green mountain, Panoramic view of Annapurna and Dhaulagiri ranges, beautiful city Pokhara Sightseeing. Day 01: Kathmandu to Pokhara drive 6 hours by tourist bus. half say sightseeing in Pokhara, overnight in Pokhara at hotel. Day 02: Pokhara to Sarangkot 3-4 hours hiking, overnight in Sarangkot at hotel. Day 03: Hiking from Sarangkot to Australian Camp -5 -6 hours, overnight in Australian Camp at Hotel. Day 04: Hiking to Dhampus village half an hour and continues hike to Phedi 1.30 hours and half an hour drive to Pokhara, sightseeing, overnight hotel. Day 05: Drive to Kathmandu by tourist bus 6 hours, overnight in Kathmandu at hotel. 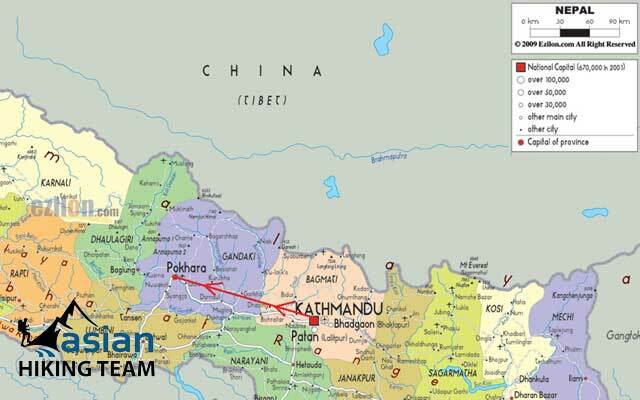 Note: It is possible to fly Pokhara or by private car/van. Itinerary subject to change as your interest and time frame. Kathmandu to Pokhara / Kathmandu bothway by tourist bus. 4 nights Accommodation with breakfast during the hiking (2-3 star hotel in Lakeside, Hotel in Sarangkot and Australian Camp). Sightseeing by private Vehicle in Pokhara. Drop and Pick up from start and end point of hiking. Entrance fees/ permit in Pokhara Sightseeing. 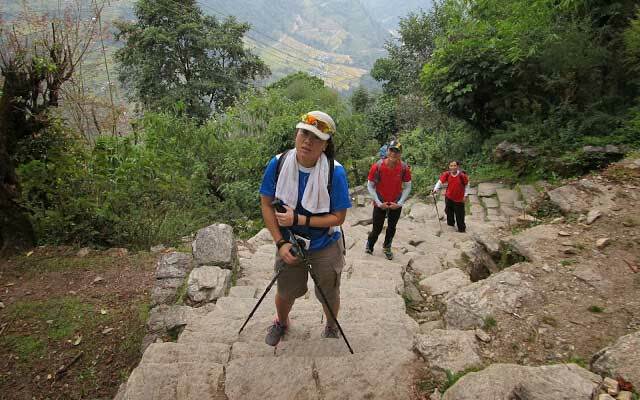 Professional equipped English speaking hiking/tour Guide. Lunch and dinner during the hiking. Domestic air ticket if you desire. Day 01: Kathmandu to Pokhara drive, 6 hours overnight in Pokhara at hotel. At 6.30 pick up from your hotel in Kathmandu, 10 minutes walk to tourist bus park. At 7am the tourist bus move to Pokhara. It takes 6 hours drive. The bus is stops for breakfast and lunch on the way to Prithivi Highway. At 2-3pm reach in pokhara than transfer to hotel. At 4-5 Pm visit to Phewa/fewa Lake, one hour boating in fewa lake and have a dinner at 6-7pm, overnight in hotel. Breakfast at 6-7am, Start hiking from your hotel to bank of the Lake, The plance call Paye where you can eat fresh fish. After that the trail goes up to climbing. The fist of climbing through the jungle after that we meet the local house. it is very nice walking because you always see the beautiful Fewa Lake, I mean carry the Lake and climbing the hill. Wehen you will be to of the hill, is call Sarangkot. It is so intesting to see the many Paraglading such as birds. Transfer to hotel, have lunch and walk around the ride of the hill. See the sunset view which is very nice and dinner, overnight in Hotel. 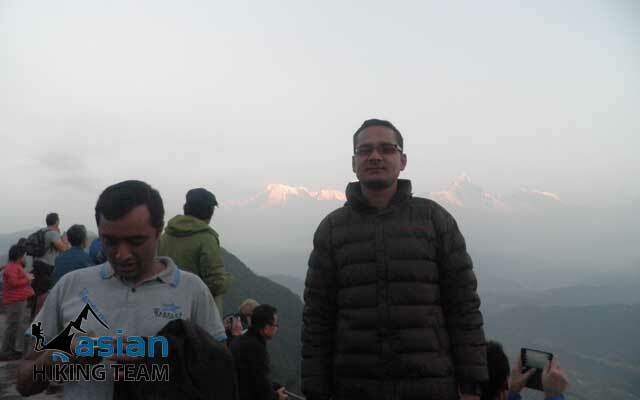 Wake up early morning for sunrise view at 5am, enjoy the sunrise view from Sarangkot hill top. There is view tower, its interesting view when the sun touch to the Himalaya. You can see the view start from left handside Mt. Dhaulagiri 8167m continues all the way to Nilgiri, Annapurna I, Annapurna south, Himchuli, massif view of Machhapurchchhe or "Fistail", Annapurna III, Annapurna IV, Annapurna II, Lamjung Himal at last the range of Manaslu. After sunrise view and breakfast hiking start at 8am. The first part hiking is follow by off road so its easy hiking 2 hours to Naudanda and again 1 hour to Dumre. You have lnch at 12pm to 1 pm. The last one hour hiking is climbing to reach Australian Camp which is wunderful view. overnight in Australian Camp at Hotel. Day 04: Hiking to Dhampus village half an hour and continues hike to Phedi 1.30 hours and half an hour drive to Pokhara. At 5am morning call. See the untauchable mountain view from Austalian Camp includes Mt. Dhaulagiri to Manaslu with beautiful peak Fishtail. At 7-8 am have a breakfast and start at 9am hike to Dhampus village half an hour and continues hike to Phedi take 1.30 to 2 hours all the way down, have many staps. Lunch in Phedi at 12pm and half an hour drive to Pokhara, transfer to hotel in Pokhara. After that short sightseeing or boating and shopping. At 6-7pm dinner. overnight in pokhara at Hotel. After breakfast at 7am drop to tourist Bus Park for own way journey to Kathmandu 6/7 hours. Its stop for Lunch on the Prithivi way Highway, transfer to hotel in Kathmandu, overnight Katmandu. Note: if you are looking 4-5 start hotel or budget hotel, the price may change.